Office Cane chair has been designed by Pierre Jeanneret. Together with Le Corbusier. In the 1950es they created a vision of new living, where modernity and tradition came together. The chair is in teak and cane. Very rare on auctions to sell. With cushions sold in New York, Los Angeles and London. The spirit of India and modernity of Europe created a world, where archaic and modernity get an unity. Le Corbusier left soon the project and was looking for new challenges. 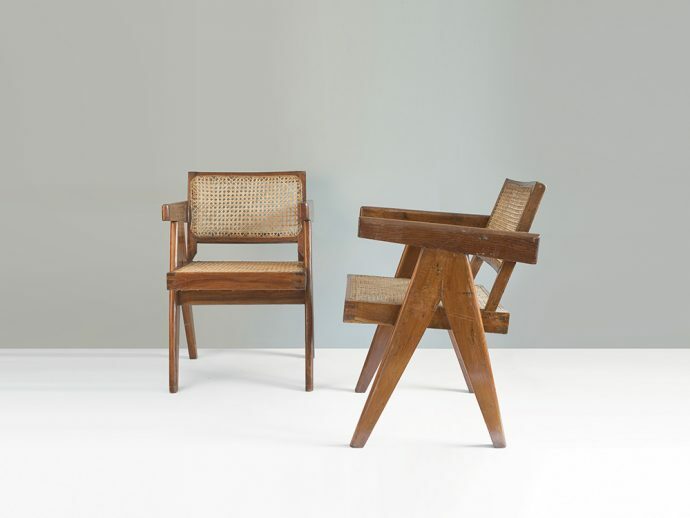 Pierre Jeanneret continued to live in India and has got professor on the architecture faculty there. There he lived for 15 years, worked on the city and developed a big amount of great design. Seat of chairs as dining chair or as office object. A piece of history. Extraordinary beauty and fitting to tables and desks. Fantastic design and furniture of chairs.